Each tablet contains the enzymes serrapeptase, protease, bromelain, papain and nattokinase including cofactors of calcium, caprylate, magnesium and ammoniate. 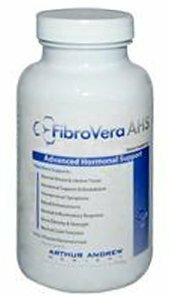 It also contains estrogen balancing herbs with DIM and liver cleansers as milk thistle seed, dandelion root and Hyssop.Fibrovera is a gentle option that offers the opportunity to regain hormonal balance in women as well as relief from chronic pain, bleeding and discomfort. Each tablet provides the perfect balance of hormone stabilizing ingredients in combination with fibrinolytic enzymes, and liver cleanse support.Fibrin is the key building block of tissue repair and is created by the uterine myometrium in response to pregnancy and miscarriage. When female reproductive tissues are exposed to excessive estrogens this repair cycle runs continuously forming more and more fibrin This binds with uterine tissue to form fibroids and fibrocystic breasts. Excessive hormones can be due to poor diet, stress, genetics and environmental chemicals. Fibrovera can not only stop but also reverse the excessive secretion of fibrin to reduce estrogen dominance, fibroid tumors, fibrous breasts, and Endometriosis. Fibrovera is a first line choice compared to surgery for fibroid removal that can cause scarring or hysterectomy that has long-term negative consequences in a woman’s life. Fibrovera can stop and reduce fibroid growth which can interfere with implantation and pregnancy. With continued use and higher doses fibroids can shrink naturally without surgery or complication. It assists in balancing excessive estrogens and other hormones that may alter menstrual cycles. It can reduce endometriosis, adhesions and polyp growth therefore improving the chances of pregnancy. MCF is a Canadian distributor of this product for your convenience.